Product #6673 | SKU NC3FXXB | 0.0 (no ratings yet) Thanks for your rating! 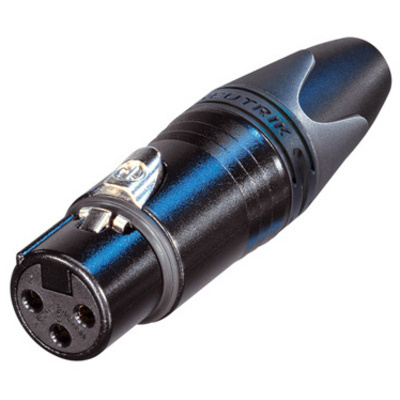 The NC3FXX-B Neutrik Connector is a heavy-duty female 3-pin XLR (XLR3F) connector for soldered termination of three-conductor audio cables. This connector has a black metal housing and gold contacts. It is part of the XLR cable connector family. It is reliable, easy to assemble and improves contact integrity as well as cable strain relief.